The Bats and Ghosts 5k Tour unveils a darker side of Austin that often goes overlooked. Austin was home to the first documented serial killer in America. For about one-hour in the evening, meeting at 7:30pm, you will explore that theory along with dozens of other murders, suicides, and hauntings throughout the Downtown, led by a professional guide. You will also visit the largest bat colony in North America on the Congress Ave Bridge where you'll see a 1.5 million bat exodus for the night's hunt. Many of the sites and stories on this tour are morbid and macabre, so if you don't like being scared, this isn't for you. The Ann W. Richards Congress Avenue bridge in downtown Austin is the spring and summer home to some 750,000 bats with up to 1.5 million bats at the peak of the bat-watching season. Each evening around sunset the Congress Avenue bats emerge like a black cloud from the crevices of the bridge. Covering the countryside in search of food, it is estimated that the bats consume from 10,000 to 30,000 pounds of insects. 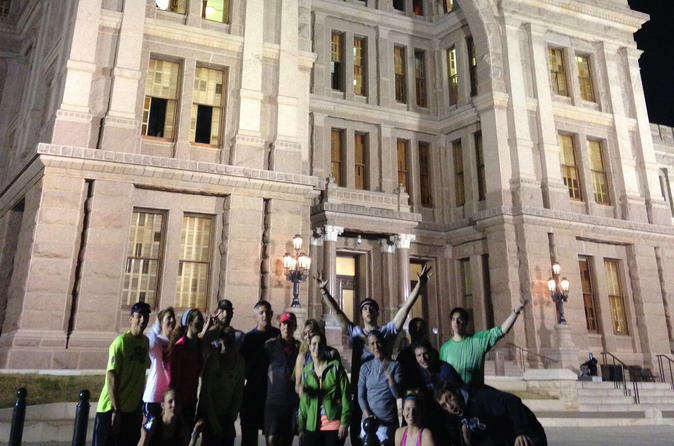 On a casual 5k running tour, departing at 7:30pm, you will explore some of Austin's most famous haunted landmarks including the Driskill Hotel, the Governor's Mansion and, the Congress Avenue bridge, where you will witness the exodus of the largest bat colony in North America. Tour is approximately 1 hour and there is generally 1 guide per 6 people. You depart the same location where you met the guide, at The Driskill Hotel Lobby.